30 years ago last week, The Arsenio Hall show debuted and changed late-night TV forever. More importantly, it changed urban music on TV forever. This was only about a year after Yo! MTV Raps hit the scene, and a year before In Living Color and Fox’s hip-hop centric line-up, so there weren’t many spaces to see our artists and our culture on mainstream TV. Arsenio changed that, and created a space for black music and culture to get comfortable and make itself at home. Tonight, we’re gonna run through some of his best performances and moments, starting with hip-hop. …but the bookers for the other late night shows probably ain’t even know what a Das Efx or a Fu-Schnicken was. Arsenio did, though. More importantly, his audience did. The Dog Pound was the livest audience on TV. They were gonna stand up, they were gonna cheer. That energy gave the performers energy. And then there were acts that other shows just weren’t going to deal with because they were too controversial. Arsenio had no issue with that, either. Sigh…This LL is my favorite LL to look at. And it wasn’t just home for hip hop, but for young urban acts across the board who other late-night shows weren’t paying due attention to. You knew you could find them doing what they wanted to do how they wanted to do it, here. I still don’t know why Johnny was dancing so damn hard in this performance. They sped the BPM’s up and everything. We had Apollo (if you could stay up late enough) and Soul Train, but both shows preferred their talent perform to tape. So in addition to this being a prime TV platform, you were usually going to get a stronger, better performance. Arsenio’s run synced up almost directly with my years in high school, and teenage me used to get my WHOLE ENTIRE LIFE. Also, this is still one of my favorite songs. Right now. Side note: Troop stayed doing all the choreophraphy for a mid-tempo. All of it. All on the floor in white rayon suits. You could get your new jack swing on, your west coast rap on, your east coast rap on, your early conscious alternative hip hop on. Arsenio was a party. But Arsenio also made room for the foundational artists and legends, like bringing Stevie out to join K-Ci and JoJo. Or asking Luther, who was on his very first show, to hit a quick a capella moment (for the haters — some of which are on this timeline right now) during his last show. Luther had done told the band leader what key he needed and Arsenio was like naw. Or when he joined the Temps for a verse of “My Girl” (Cause wasn’t nobody coming to see Otis). But please get into the precision and the footwork before Arsenio comes to join them. A PERFORMING GROUP. The other thing that set Arsenio apart were the interviews. He gave even established personalities more couch time with less pressure than they got on other shows. He was actually criticized for having too soft a touch in his interviews. But his style put talent at ease, and you heard stuff on Arsenio’s couch you weren’t gonna hear anywhere else. This is a STARK illustration of how much social norms and the climate has changed since the early 90s. Grown, enlightened Will Smith would NEVER. And while there were a few tense interactions during the show, Arsenio didn’t seem to have any real beef with anybody — except Oprah for a minute (for making a Steadman joke) and Spike Lee (who called him an Uncle Tom). Martin put rumors of a rivalry between the two to rest when he was promoting Boomerang. Martin even patterend a character after Arsenio. I guess we’ll all have to individually decide whether it was compliment or insult. Knowing he had the attention of the MTV & Hip Hop generation, Arsenio also participated in anti-drug campaigns with DARE, and produced and starred in an HIV awareness campaign with friend Magic Johnson. 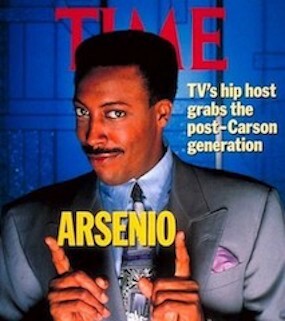 By 94, Arsenio’s ratings were slipping due to a number of factors (more on that in this week’s Vibe Magazine #MusicSermon, linked below) and he decided it was time to step down. Latifah gathered a ridiculous crew of rap artists for a surprise segment in his last show. It was only fitting that hip hop say goodbye. By the time The Arsenio Hall Show was over, hip-hop culture had made its way into mainstream culture, but while others attempted to create another black late-night space over the years, including Arsenio himself a few years ago, it was never quite the same. We’re not finished yet! Now head over to second service at @VibeMagazine for a deeper dive in Arsenio’s rise, his vision, what made the show click, and why it had white Hollywood in its feelings. Then continue down memory lane with more clips and performances with the YouTube playlist.